Are there performance issues with your SQL Server infrastructure? Do you have problems with updates, back-ups and availibility of your SQL environment? 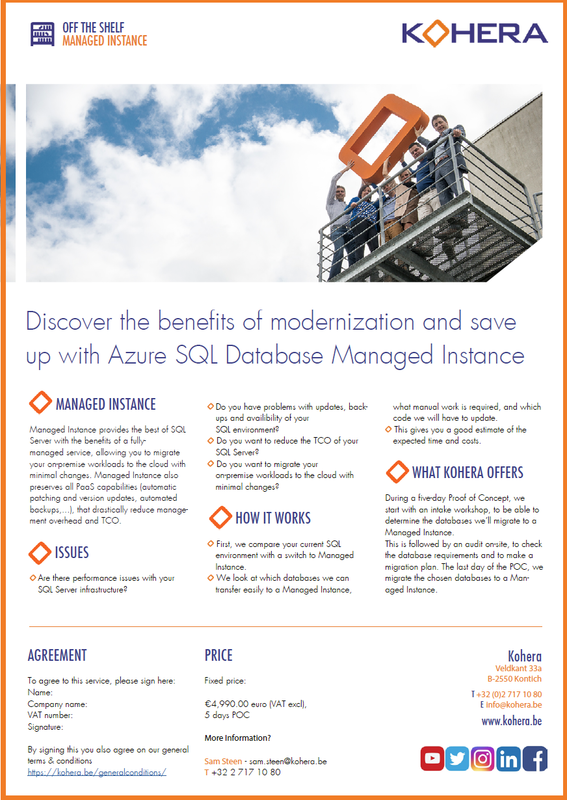 Do you want to reduce the TCO of your SQL Server? Do you want to migrate your on-premise workloads to the cloud with minimal changes? First, we compare your current SQL environment with a switch to Managed Instance. We look at which databases we can transfer easily, what manual work is required, and which code we will have to update. Ordering this POC is very easy. Just fill out your name and email address below, and follow the next steps. You will need to mention your VAT number too, so please have that information at hand. Give us a call at +32 2 717 10 80 for assistance. When we’ve received your order, we’ll contact you straight away to plan your workshop. Thank you for your business.